2007 Alexana Revana Vineyard Dundee Hills Willamette Valley Pinot Noir $38 Moderate garnet color in the glass. Lovely and seductive nose which hints of gardenias upon opening, evolving to reveal aromas of strawberry tart, baking spices and red cherries. Soft and elegant on the palate with gossamer tannins, offering the delicious essence of fresh red berry fruits with herbs, toasty oak, and spices under tow. A feminine expression of typical Dundee Hills Pinot Noir that holds considerable charm. 2007 Anam Cara Cellars Estate Reserve Chehalem Mountains Willamette Valley Pinot Noir 280 cases, $45 Alluring perfume of blackberries, plum sauce and tea with a hint of oak. Rich but not cloying array of berry fruits that are thoroughly engaging. Admirable finesse, perfect harmony and a finish that keeps you coming back for more. Great two days later from a previously opened and re-corked bottle. A keeper that is liquid nobility. 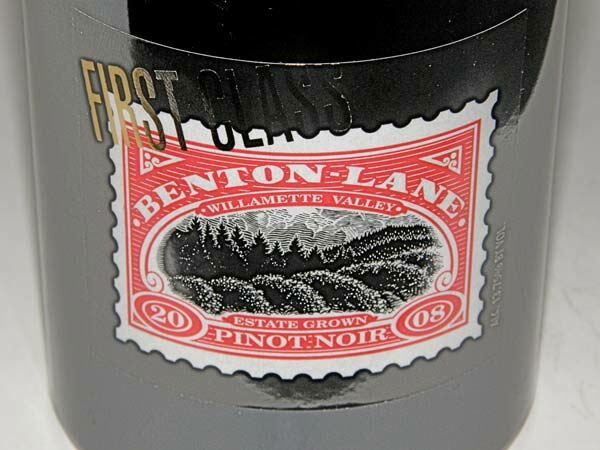 2008 Benton Lane Estate Grown First Class Willamette Valley Pinot Noir 740 cases, $60 Moderate reddish-purple color in the glass. Wonderful perfume of spiced dark cherry and berry fruits, anise, and rose petals, picking up intensity over time. Delicious raspberry and cherry cola flavors cloaked in ripe, fine-grain tannins leading to a pleasingly aromatic and persistent finish. A sophisticated wine that is both sensual and beautifully crafted. This wine will find many fans. 2008 Carabella Mistake Block Chehalem Mountains Willamette Valley Pinot Noir 90 cases, $55 All the Pinot fruits are represented in the nose with some added floral interest and spice. Very tasty melange of dark red berries, black cherries and plums with an earthy undertone. Constantly intriguing, revealing nuances with every sip. Pleasingly smooth in the mouth with firm but silky tannins. I just love the seamless texture of this beautiful wine. 2008 Lange Estate Winery & Vineyards Freedom Hills Vineyard Willamette Valley Pinot Noir 250 cases, $60 Restrained aromas of black cherries and blackberries with smoky oak taking charge. Big and juicy, thick and viscous, with serious fruit intensity. Dark fruits dominate the profile with an underlying earthiness. Mildly firm tannins reel in the massive fruit, and should soften with aging. This is a huge wine that will make many California Pinots seem wimpy in comparison. Needs time to shed its oak, integrate the tannins and tame the explosion of fruit. An amazing gulp of old vines fruit. Ride this wine to heaven in a few years. 2008 Laura Volkman Jacob Estate Chehalem Mountains Willamette Valley Pinot Noir $50 An alluring nose of exotic scents including dark red raspberries, rose petals, Asian spices and seasoned oak. A challenge to adequately describe. Very tasty essence of fresh fruits including plums, berries and pomegranates veering more to the purple spectrum. Ridiculously silky and almost ephemeral, like swallowing flavored air. A wonderful wine with mature dry tannins perfectly balanced by the ripe fruit and lively acidity. Can be drunk now for its hedonistic fruit, but will reward further cellaring and provide several years of drinking enjoyment. 2008 LaVelle Vineyards Matthew’s Reserve Willamette Valley Pinot Noir 430 cases, $36 Moderate reddish-purple hue in the glass. Somewhat brooding initially, but opening nicely with coaxing to reveal an intense perfume of fresh darker berries and cherries with a subtle savory and floral note. More structured and intense than the winery’s regular Willamette Valley bottling, with tasty flavors of cassis, black cherry and anise augmented by a note of loamy earth and oak in the background. The impressive depth of flavors really grabs your attention. Drinks easily now but will be better with another year or two of cellaring. A Pinot Noir that deserves the Reserve designation. 2008 Pali Wine Co. Momtazi Vineyard McMinnville Willamette Valley Pinot Noir 150 cases, $44 This is a charming wine with pleasing aromas of dark stone fruits and raspberries with an undertone of sweet oak. Ornate and well-delineated flavors of juicy cherries and berries with a subtle loamy undertow that is typical of the McMinnville appellation. Very slick with a soft texture much like a baby’s bottom. Everything sings in harmony with perfectly balanced t n’ a. Still drank beautifully the next day from a previously opened and recorked bottle indicating age ability. 2008 Shea Wine Cellars Shea Vineyard Block 5 Yamhill-Carlton District Willamette Valley Pinot Noir $55 Moderately dark reddish-purple color in the glass. You can really cozy up to this wine. Lovely perfume of blackberry jam, spice, mocha and that floral Sheaness. Like greased lightning on the palate with a delicious red and black berry core including alpine strawberries and red plums. Very harmonious with ripe, firm tannins and a generous, slightly warm finish that sails along. Even better the next day from a previously opened and re-corked bottle. I am not usually a fan of single Dijon clone (777 in this case) Pinot Noirs, but it definitely works here. 2007 Sineann Wyeast Vineyard Columbia Gorge Pinot Noir $35 Patience is required to fully enjoy this wine. I found that it grows on you as it becomes significantly better over time in the glass. Appealing aromas of dark red cherries and berries with a hint of toasty oak emerge. On the palate, there is a delicious essence of fresh cherries and berries with a hint of soy and cherry skins. Beautifully balanced with bright acidity on the showy finish which sails along. This wine clearly shows the promising potential for Pinot Noir in the Hood River region of Oregon. 2008 Willamette Valley Vineyards Fuller Willamette Valley Pinot Noir 25 cases, $100 Moderately intense reddish-purple color in the glass. Shy but pleasing aromas of berry compote, currants, raisins and supporting oak. Impressive core of juicy darker berry fruits framed by bright acidity and wrapped in soft fruit tannins. Discreetly proportioned in body and weight with deft use of oak. Flat out terrific four days later from a previously opened and re-corked bottle. A very special collectible wine that will reward the patient.